Our Schools & Universities Security Group offers complete services for crisis response planning for the risks associated with crime and terrorism, as well as school gunman and shooting situations. Security Dynamics uses two separate methodologies to assess campus facilities. First, a school and campus-specific risk assessment methodology (S/RAM) – which we have modified to evaluate sector-specific threats, vulnerabilities, and consequences – is applied. Second, Security Dynamics uses its own proprietary vulnerability assessment methodology, which provides a narrative evaluation coupled with specific recommendations developed for the US and international academic communities, and reflects the guidelines suggested by the National Crime Prevention Council. These applied methodologies identify security weaknesses and recommend corrective measures to mitigate the consequences of possible security breaches or incidents. Security Dynamics employs this ‘risk-based’ approach to identify and evaluate the potential for attacks against campus facilities and grounds from credible threats, as well as unexpected security events and their potential consequences. This approach combines the likelihood of attack, potential consequences, and the effectiveness of security systems, (e.g., physical security infrastructure, security guards, and local police force), and helps define and prioritize systems, equipment, and manpower requirements. This methodology also identifies a recommended man/machine mix to maximize the effectiveness of security systems, such as CCTV, while minimizing recurring manpower costs. This approach helps our client achieve a return on investment (ROI) that will potentially see security systems paying for themselves over time. This is part of Security Dynamics’s unique approach to value-engineering security solutions. •Planning: Security Dynamics will perform pre-deployment planning and evaluation activities that include analyses of client-provided information and documentation about each of the facilities to be assessed. Reviews will include access controls (e.g., doors, locks), CCTV and other surveillance systems, fencing, lighting, visitor controls, etc. Scrutiny will be given to vehicle access relative to changes in threat levels issued by local police. Liaison will be conducted with the client’s facility security managers, local police, county sheriff, and other law enforcement agencies as required. •Threat Assessment: Security Dynamics will conduct a pre-assessment of the credible threats associated with the client school and its operations. This will include research to ensure the perceived threat profile is as accurate and current as possible. The goal is to provide reality-based recommendations coupled with risk mitigation strategies that apply to credible threats and not the universe of threats. This assists the client in husbanding resources and expediting risk-reduction measures. 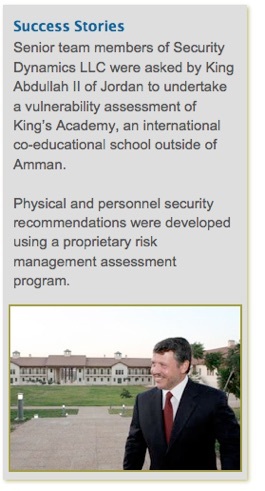 •Site Characterization: Security Dynamics will conduct on-site surveys of school facilities and operations and interviews with teachers, staff, and students. •Consequence Assessment: Our team will analyze the data collected during the threat assessment/site characterization phases of the project to assess the potential consequences of attacks by identified credible threats, prioritizing them by the degree of their impact on persons, operations, budget, and environment. •System Effectiveness: Security Dynamics will analyze the effectiveness of planned security systems, equipment, and guard staff to identify deficiencies that increase a facility’s vulnerability to attack. •Risk Management: Based on the results of its analyses, Security Dynamics will develop a risk mitigation strategy that prioritizes recommended measures to correct identified deficiencies, minimize vulnerabilities, and reduce the risk of a successful attack by the identified threats.